Since Kotlin M3, you can use external annotations to tell the system that your methods return/take non-null values. This mechanism is useful even if you don’t use Kotlin: you can turn on nullability inspections for Java too (and I totally recommend you to do so). One problem about this used to be that, while you can annotate your own code while you write it (and we do it all the time at JetBrains), your favorite library is not annotated, and it is so big, you can’t annotate it manually. The key thing here is that ‘manually’. A programmer is a lazy creature, and by virtue of our laziness, we want to automate as much as we can. KAnnotator is a tool that annotates your libraries automatically (the tool is written in Kotlin, of course). Now, you can attach these annotations to your project, and both Java IDE and Kotlin compiler will see them. We used KAnnotator to infer annotations for JDK that ship with Kotlin. Now you can use it as well: to annotate your own libraries. KAnnotator ships as a separate plugin for IntelliJ IDEA 12 or higher (both 12.0.4 and 12.1 will work). Note that the Kotlin plugin is not required. To install the plugin, follow the instructions from here. 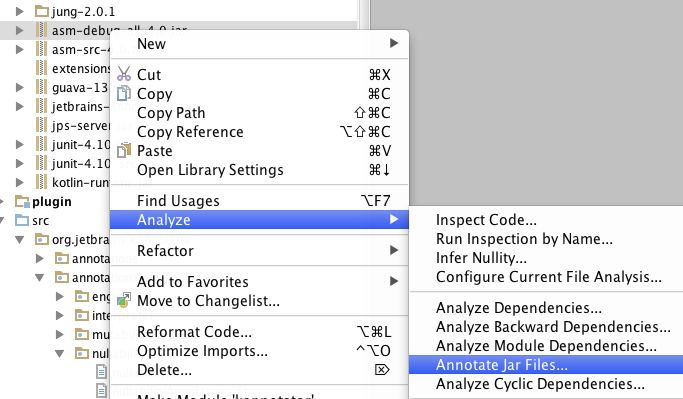 There you specify what JAR files you want analyzed and where to put the results, i.e. XML files containing annotations. 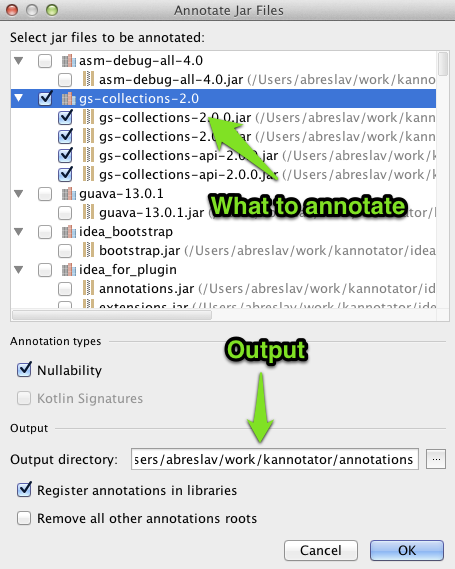 By default, KAnnotator will attach the annotation to the libraries you call it on. So, when you see Kotlin complaining about nullable types coming from Java, all you need to do is run KAnnotator once on that Java library, and it will turn your red code green. If it does not, maybe KAnnotator is not smart enough, but maybe that method actually returns null? Interesting tool. I’d like to try it on a large maven-based project I have at work, but I’d need an hour just to click all the checkboxes on all the libraries. Could you include a ‘select all’ button in the next version? Sure. Meanwhile you can select all (Ctrl+A / Cmd+A) and press Space to check the boxes. Thanks for the tip, that works quite well. While trying to run all several hundred jar through KAnnotator, eventually IDEA would run out of memory. Is this a known issue? Yes, we are working on optimizing memory consumption. KAnnotator puts the annotations in a directory for each library. However, this doesn’t work well with Maven, where I’d just like to set a root and have all of the annotations under the same root. How do I make KAnnotator not include the library directory and just populate a common tree? I’ve had some issues with IDEA assigning various nullability annotations to things, that then cause them to break when my colleagues try to use the source code in a different IDE (eg. Eclipse), because the annotations aren’t in the classpath (we use Maven, and try to keep everything cross-IDE). Would you mind clarifying how to take advantage of these nullability annotations in a cross-IDE manner (at least so that it doesn’t break the source code in other IDEs)? In what way does it break the code? (IntelliJ only issues warnings upon nullability issues, never errors, so the code should always compile). In that it added annotations to the code that weren’t in any Maven dependency (IIRC it was some auto-generated method, sorry – it was a while ago). Worked locally, but not elsewhere. I guess the broader question is: If IDEA nullability annotations are IDEA-specific, how does this work when other people working on the source code might be using different IDEs. As far as I know, tools like FindBugs support custom annotations, and we are going to have JSRs 305 and 308 out soon, finally standardizing these annotations. The exception has been sent as error report 480295 to the exception analyzer.